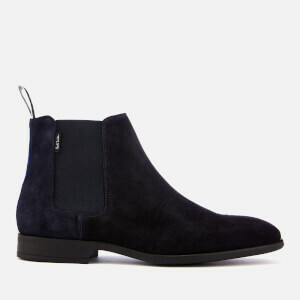 Crafted in luxurious suede, the beige ‘Gerald’ Chelsea boots from PS Paul Smith showcase all the signature features of the classic design, including a rounded toe, an elasticated side gusset and a narrow ankle. Cushioned footbeds ensure comfort and support, while the grosgrain pull tab allows for easy on and off. Set upon a leather sole with rubber inserts for grip and traction and finished with subtle branding. Upper: Suede. Lining: Leather. Sole: Leather/Rubber.